I wanted to take a few moments to wish everyone a very Happy and Healthy New Year. I am sorry it has been so long since my last post but I have recently lost my father to cancer and have not been interested in anything very much lately. I am hoping that the new year will bring back my jest for living and my passion for my art work will be renewed. For those of you who were wondering about my new photographs in 2010, yes I did get to capture a few wonder full shots and I will hopefully get to download them to my online gallery in January for all to enjoy. I wanted to take a moment to show you Abigail & Hyde's pastel portrait completed last week. 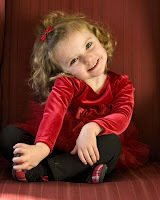 This portrait of Abby was taken by Tammie Grieshaber from Mainely Portrait Photography Studio ( http://www.mainelyportraitphotography.com/). I first saw this photograph of Abby on a coworkers desktop last Christmas and knew I wanted to paint her in pastels. I asked Beth to give me a picture of Abby's pet so that I could paint her and feature her on my website as an example of my Children and Pet Portraits in Pastels. Beth was more than happy to send me pictures of Hyde, Abby's little kitten and after asking Tammie's permission to use her photograph of Abby as reference I was on my way. Below you will see the two photographs used for reference and the resulting pastel portrait. Hello everyone just wanted to take a moment to update you on my latest pastel portraits completed so far this year. 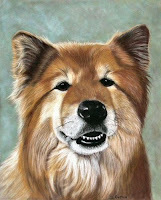 The first one was a commissioned memorial portrait of a Husky/chow mix named Java. This is a 16x20 portrait painted with soft pastels on suede mat board and was a gift my client purchased for her friend to help her through the loss of her beloved pet. The bond humans and animals have are very unique and is one of the reasons I choose to paint pet portraits. With my pastel portraits you can display the love and bond that you have developed with your animal companions and keep these cherished memories alive for a lifetime. The second portrait completed in March was of my husband's great niece Alivia and her cat Ducey painted in soft pastels on suede which will be featured on my website's Children and Pets page later in April. This is the first time I have painted a childs portrait in soft pastels; usually I draw the children and their pets in Charcoal for my clients. But this year I wanted to expand my horizons and offer children's portraits in both pastels and or charcoal. I hope to complete two more children's portraits in pastels later this year as examples of children and there pet in pastels. 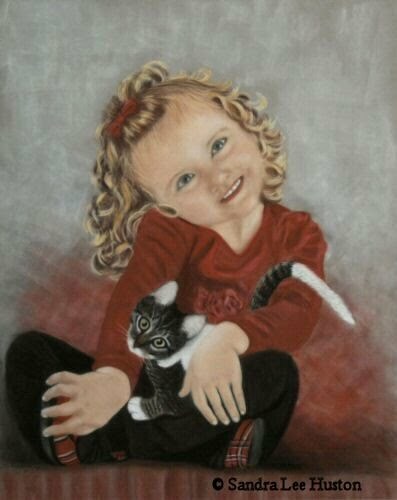 If you know of anyone who would like to commission a portrait of their child and pets just direct them to http://www.animalsinpastels.com/ or email bornhorselover@aol.com and I would be happy to answer any questions. 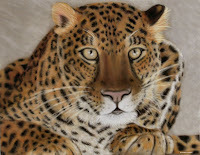 Below is a pastel painting of "Jabal" a male leopard and the first portrait completed for this series. This painting is available for sale framed and ready to hang. You may also purchase the originals or 8x10 prints for $25.00 each of any of the other pastels paintings that I will be painting in this series. 20% of the proceeds will be donated to Tiger Haven to help with the cost of feeding and caring for more than 200 big cats still residing at their Sanctuary. I hope to have the first 3 paintings in this series completed by the end of April. Please visit my new web site's wildlife page to view the next in the series for Tiger Haven, which should be uploaded and ready to view by the end of April.